I haven’t written much recently because we have been very busy the last few weeks and I know we have got lots of things coming up in the next few too. Like everyone else we are getting in to the Christmas spirit. I am really liking seeing all the Christmas lights going up as it makes the school run more festive and I love this time of year with all the parties, nativities and carol concerts so you can imagine how excited I was to be invited to go to Wyevale Garden Centre with my family for Tea with Father Christmas. 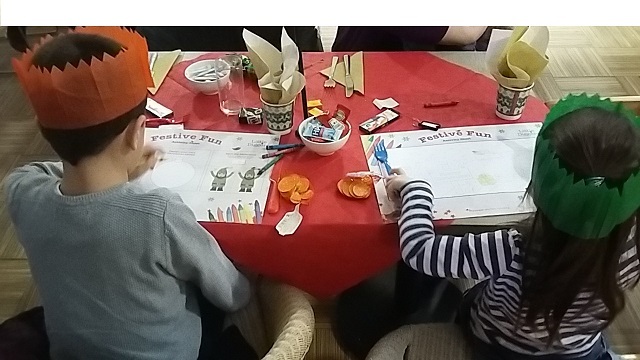 When we arrived we were greeted by an Elf and shown to our table in the garden centre restaurant, there was lots of things set up on the table to keep us busy including colouring, chocolate coins and Christmas crackers. So we pulled the crackers and put on our hats and did some drawing while we waited to see what would happen next. After we had eaten we were given a Christmas biscuit to decorate, we got a Christmas tree shaped biscuit and a bag of icing and some sprinkles and got to work making some yummy creations. Soon it was time for Father Christmas to make his appearance so we were all given bells and sang jingle bells to welcome him, when he arrived he looked very jolly and all the children queued up to see him. He was very nice and friendly and chatted to us all (although Lottie was a bit scared) and didn’t even mind when Sam tried to pull his beard!- We did stop him very quickly just in case he wasn’t the ‘real’ Santa!! At the end of the visit we were allowed to chose a gift- there was lots of lovely things to choose from and it was really hard to pick but I chose a set where you dig for Gems and Lottie picked a Mermaid doll which she loves. The Gems set is really good and I think it will be something I can use for quite a while as I have only dug out one gem so far even though I have used it quite a few times. 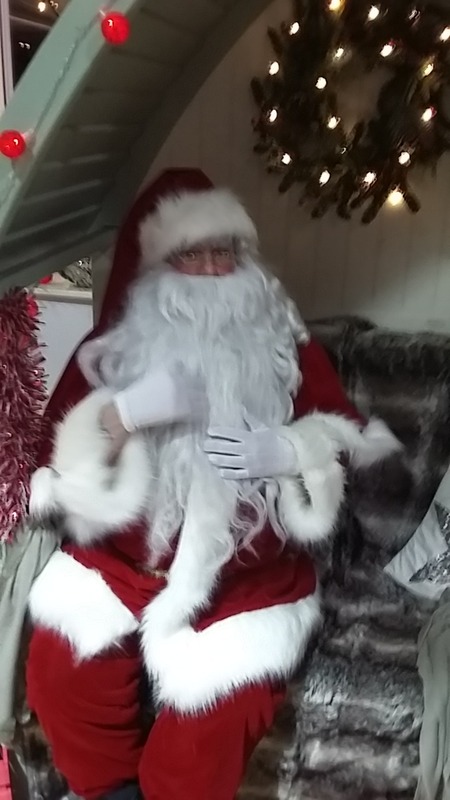 I really did enjoy our visit- Santa and the elves were really good, the food was nice and we had lots of fun- this is a really great way for the whole family to spend an afternoon together and get in the mood for Christmas.